A research team found that visual processing, as measured by visual evoked potentials, is different in patients with visual snow syndrome (VSS) and control patients with migraine who don't have VSS. Independent experts said the researchers observations offered important insights into the pathophysiology of the disorder but they questioned the use of visual evoked potentials in the study to measure dysfunction in the visual association cortex. The phenomenon of visual snow, which appears like static in the visual field, appears to be a true neurological symptom that is related to dysfunction in the visual association cortex, and it is distinctly different from migraine, according to a small study published online on November 1, 2018, in Annals of Neurology. Patients with visual snow syndrome (VSS) experience continuous television-static-like tiny flickering dots in the entire visual field and additional visual symptoms such as palinopsia or photophobia, the authors of the study explained. In patients with VSS, neurological and ophthalmological clinical examinations, as well as brain imaging, are typically normal. Experts who reviewed the study for Neurology Today said the key takeaway, that VSS is a real neurologic condition, is important. Research demonstrating that VSS is a true neurological condition is vital not only to reassuring patients but to finding effective treatments, of which there are currently none, they said. Dr. Schankin and colleagues advertised the study on social media with support from the VSS self-help group Eye on Vision Foundation. Through telephone interviews, the researchers determined if the patients met their enrollment criteria: They had to be 18 years or older and have experienced VSS in accordance with published criteria. Patients were excluded if there was evidence they used illicit drugs prior to VSS onset. The research team used visual evoked potentials (VEP) to assess the visual pathways through the optic nerves and brain, measuring the latency and amplitude of brain waves specific to vision in three groups: 18 patients with VSS, 18 age-matched migraineurs, and 18 healthy controls. Participants were seated in a relaxed position in a quiet room with standardized dimmed artificial light conditions. A screen displaying a checkerboard was placed 135 centimeters in front of the eyes with the right eye covered, and standard surface electrodes were attached to the scalp. The evoked potentials were recorded when a black-and-white checkerboard reversal pattern was presented. These findings support the idea that the primary disturbance in VSS is a dysfunction of the visual association cortex, Dr. Schankin said. Experts who reviewed the study for Neurology Today said it provides insights on a condition that is reasonably common — although prevalence studies are rare — and for which there are not good treatments. “The study by this group and others is demonstrating that the phenomenon of visual snow is a true, neurological condition and one that appears to be distinct from migraine, although there may be some overlap,” said Victoria S. Pelak, MD, FAAN, professor of neurology and ophthalmology and director of the neuro-ophthalmology fellowship at the University of Colorado School of Medicine. Dr. Pelak said the frequency of the phenomenon among patients with migraine may be related to overlapping genetic causes, or a common hypersensitivity in an area of the brain. Grant Liu, MD, FAAN, professor of neurology and ophthalmology at the University of Pennsylvania, agreed. He believes the term “visual snow” is an umbrella term for a condition that encompasses migraine but includes patients who don't have migraine. Dr. Liu published one of the first papers on the condition in 1995 in Neurology. “At the time we called it ‘persistent positive visual phenomenon,’ and we studied it in migraine patients,” he said. “The characteristics are the same as what people call visual snow: It's everywhere in the visual field, in both eyes, and pretty much constant. However, visual evoked potentials are a less than perfect method for localizing functional phenomena in the brain, Dr. Liu and his colleagues said. “The findings are interesting, but the evoked potentials are not that sensitive or reliable and can be highly dependent on where the leads are placed,” said Kathleen B. Digre, MD, FAAN, distinguished professor of neurology and ophthalmology and chief of the division of neuro-ophthalmology and headache at the University of Utah. •. Eren O, Rauschel V, Ruscheweyh R, et al Evidence of dysfunction in the visual association cortex in visual snow syndrome https://onlinelibrary.wiley.com/doi/abs/10.1002/ana.25372. Ann Neurol 2018;Epub 2018 Nov 1. •. Schankin CJ, Maniyar FH, Sprenger T, et al The relation between migraine, typical migraine aura and “visual snow.” https://onlinelibrary.wiley.com/doi/full/10.1111/head.12378 Headache 2014;54(6):957–966. 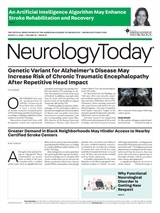 Neurology Today19(1):10-11, January 10, 2019.